The HR club proudly presents “NEXUS”, the monthly newsletter published by it. This edition is for the month of August (2016).And the theme this year is ” Trends in HR “. The 21st century has witnessed technological advancements in almost all the fields known to man. When it comes to the field of HR, there has been a revolutionary change in the process of recruiting workforce. Traditional tools of job postings in print media have become redundant and there has been a surge of social media becoming a critical platform for contacting the employees before selecting them as a part of an organisation. So social recruiting basically means hiring candidates using social networking sites like Facebook, Twitter, LinkedIn, Google+, Instagram etc. I will discuss the three major and most influential social media portals i.e. LinkedIn, Facebook and Twitter. LinkedIn is a dedicated networking business site that offers easy access to information that is presented in the format of a resume.It is an interconnected network of experienced professionals from around the world, representing 170 industries and 200 countries. There are over 65 million professionals on LinkedIn. Recruiters often post jobs to attract the best talent, companies sign up for “LinkedIn Talent Advantage” and other free resources that LinkedIn offers. As a LinkedIn user, we must try building connections with people, be it our co-workers, current clients, friends and family and also be parts of active groups related to our field of expertise. This helps recruiters take notice of you if there is a job posting matching your interests and skill sets. Facebook is the largest social networking site which connects people with friends, family and business associates and currently has over 400 million users. Nowadays every company has its own Facebook page to advertise their products. Recruiters post jobs for free in the Facebook Marketplace and on Facebook pages. It thereby becomes important as to what we post and share on Facebook as our profile is under scanner by recruiters who may find us suitable for their job opening. Talent Advantage and other free resources which LinkedIn offers. As a LinkedIn user, we must try building connections with people be it our co-workers, current clients, friends and family and also be parts of active groups related to our field of expertise, this helps you get noticed by the recruiters if there is a job posting matching our interests and skill sets. Facebook is the largest social networking site which connects people with friends, family and business associates and currently has over 400 million users. Now-a- days every company has their own Facebook page to advertise their products. Recruiters post jobs for free in the Facebook Marketplace and on Facebook pages. It thereby becomes important as to what we post and share on Facebook as our profile is under scanner by recruiters who may find us suitable for their job opening. Twitter is a microblogging social networking service where you can “tweet” and connect with the right audience at the right time while expressing yourself in not more than 140 characters. Companies have twitter accounts where they tweet about job vacancies. Recruiters tweet regarding job postings and skills required using hashtags to make their advertisements stand out. Recruiters can find potential candidates on Twitter by evaluating their twitter activity, how often they tweet, their quality of tweets, how large their network is and if they have a healthy balance between followers and the people he is following. Be professional on your Facebook and twitter pages if you want to create an impact as a potential employee. Follow companies and career related hashtags and like their product/services page. Being active on social media sites thereby becomes important as it helps us become readily accessible to the recruiters and help them get to know more about us, our skills, suitability for a particular job profile etc. In today’s time, it can be seen that Using LinkedIn, Facebook and Twitter takes recruiting back to its grass roots of networking but for a digital age. The SIMS way of life was nothing less than a roller-coaster ride for me. Each day came with a new challenge; be it the orientation, waking up early in the morning for 8 am classes (then getting a mini heart attack after receiving an e-mail informing us about the water shortage), cursing the IT cell for WiFi that worked at a snail’s speed, maintaining 90% attendance, doing assignments, Time Table change emails, last minute presentations…the list is endless! But if I could summarise all this in four words, they would be – A journey worth remembering. By the end of the fourth semester, this college equipped me with the knowledge and wisdom, learning and experiences that are a must in the corporate world. In the beginning, I was taken aback by the plethora of things going around me, but with time I was able to carve out a niche for myself. And I won’t be wrong in saying that I have enjoyed every moment spent at SIMS. If given a chance, I would love to relive all those memories again. As for you, just enjoy your life at SIMS now, because these days will never come back. Being a “SIMSite” is a wonderful thing. Find out your path and you will never be disappointed with the memories that you will make here! Cheers!! 2. 93% companies use LinkedIn for recruiting & 89% have been hired. 6. 70% of College Students, who lie on resume get the jobs they wanted. 7. A single mistake in your resume will prevent you from moving forward. 61% for Typos. 43% for Spelling Mistakes. ‘BARCODE’ which is the national level “Best Manager” event by SIMS, was launched in the fond memory of our beloved faculty, Prof. Deven Dhanak. This year’s event kicked off with the introduction round of the 8 finalists, who were selected pan India from colleges like FMS Delhi, IIM-Trichy, IIT-B, NIAM-Jaipur and our own SIMS. The contestants introduced themselves with poetry, singing, dancing and even showing off some of their muscle power. While rest of the student managers were busy enjoying events like arm wrestling, limbo pole, splash, pitthu, money ball, snakes and ladder, scavenger hunt, the participants were wrestling throughout to be the last man standing. Not only were the participants challenged to bring the best of their managerial prowess to the table but also, their physical endurance was tested, as they had to compete from dawn to dawn in a wide spectrum of tasks. It had Media Mayhem, Smart Sell, Pictionary, Bidding, Are We Real?- Movie Analysis and Case Studies from the four major specializations namely, HR – ‘SYNERGIO’, OPERATIONS – ‘TAKE-OFF’, FINANCE – ‘TIE – UP’, MARKETING – ‘NRITYA’ and was topped-off with a B-PLAN COMPETITION – ‘JUNK IT’. After 36 hours of non-stop grilling and rigorous testing of their managerial skills, “PUSHKIN KASAT” from ‘SJMSOM, IIT Bombay’ emerged as the WINNER and was followed by “MANDEEP SINGH” from “SIMS, Pune” as the ‘RUNNER-UP” of BARCODE 2014 “TESSELLATE”. Many congratulations to the well deserving winners!!! The editorial and the media relation cell in collaboration with Pranay brought the student of SIMS together to take the #simsicebucket challenge. It is an initiative to fight against the cause of cancer. Our very own Director sir did the flag off; he commenced the event by pouring water on the students. The students at SIMS believe that alone we can do so little and together we can contribute so much, with this very belief large number of our student managers participated and donated generously. We look forward to many such events to raise money and help the under privileged. August 2014 as a part of SIMS Annual business seminar Colloquium 2014,Strategem 2014 was conducted by the infinite Club. We all witnessed the global monetar crisis that took place in 2008; the world is still recovering from the setback. Strategem 2014 theme “The Responsible Financier – India & Abroad” was to inculcate the sense of responsibility among the student managers such that such epidemics can be avoided in future. Eminent Speakers such as Smriti Vijay (CFO & Director, Aker Solutions), Seshasayee Shankaranarayanan (VP, Credit Suisse) and Ajay Kumar Asati (Associate Dir -Research Analytics, Crisil) gave a detailed insight on the topic and shared their experiences in the Our director initiated the event by highlighting that everyone today needs to have a good know – how about finance. It doesn’t matter if you specialize in marketing, finance or HR if you are a working professional you should know finance. Mr. Ajay Kumar Asati gave knowledgeable inputs on what eventually led to the sub – prime crisis, sovereign crisis and libor scandal. He emphasized on need for enforcement of policies and ethical practices by financial intermediaries to avoid such crisis. Mr. Seshasayee Shankaranarayanan explained evolution of banking system from fundamentals to catering greed of economies. He explained that how in last 5-6 years regulating bodies all over the world have tightened the financial system and how banks have become more responsible. Ms. Smriti Vijay discussed the rising demand of risk management and how banking system works on the supply –demand (of fund) dynamics. The event was concluded with Q&A session between the eminent speakers and student managers where again few of the upcoming trends in finance sectors such as BRICS bank,m – banking, impact of fiscal inclusion etc. were discussed. Janmashtmi the birthday of Lord Krishna is celebrated with great belief and devotion and we the students at SIMS followed the tradition with great zeal and enthusiasm on 18th Aug 2014. Commencing by the lightening of the lamp by Director Sir enlightened the atmosphere. 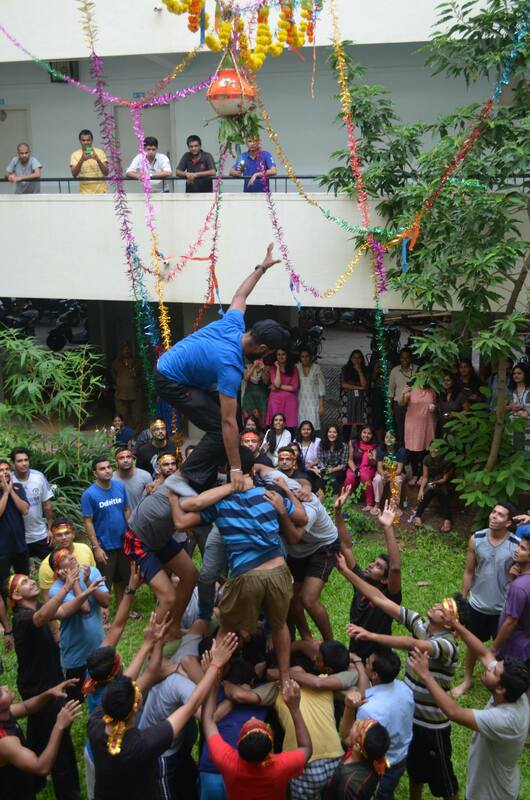 Seniors came in large numbers and also motivated the juniors to be a part of the “Dahi Handi “competition. The Govindas and SIMS ki Goriyas won the competition, team effort showcased by the student managers provides a glimse of their managerial skills. It was a successfulevent followed by dance and dinner. 08-Aug-14 commenced the Annual business seminar Colloquium 2014 with its first event 4Thought. The topic was “An insight on Global Indian Management Thought Process”. As our director rightly said one can learn more from people with knowledge and experience. The college saw many eminent speakers from corporate background who gave an insight on the topic. They spoke about their experiences in other countries and their observations on Indian style of management. Mr Ajay Bhandari spoke about how the perception of people in USA about India has changed over the years. Thanks to globalization India has come a long way from a country of elephants and snake charmers to a dependable country of highly skilled and capable people. He spoke about how Indian style of management is completely different from the others. We Indians find it difficult to adhere to processes but do deliver the results qualitatively. Organized chaos works for India. Various speakers highlighted the fact that Indians have the “Somehow made it in time” attitude, popularly called as “Jugaad”. We find a way to do things which otherwise seem ambiguous hence impossible. We take up a challenge and deliver which sets us apart from the others. Indian management is adaptable, progressive and can be used anywhere. On the 27th otherof July 2014, Lighthouse 13 at Saket was a venue filled with a crowd, like no other. In attendance were a range of SIMS Alumni spanning over 20 batches. The crowd was enthusiastic and elated to see one another post their college days and spent most of theevening catching up with one another and reminiscing the times gone by. Moreover it was an occasion made even more special with the ten and fifteen year anniversaries of the 2004 and 1999 batches. Also in attendance was Mr. Rahul Yadav, a notable SIMS alumnus battling blood cancer. He is also the founder of the notable cause ‘Yoddhas’. He is working towards spreadingawareness about the fatal disease of Blood Cancer and garnering support from the online masses towards this initiative. The meet was successful in bringing together the alumni from different batches and helped them interact with both their junior as well as senior batches, allowing them to recollect the SIMS way of life, and what it means to be a SIMS-site for life! This article is contributed by Lipakshi Gera (Batch 2014-16). Lipakshi is a part of the JEdi ( Junior Editor) team for 2014-15. The junior debate championship – Verbaturn 2014 a joint initiative by Confero (Debating Society) and “Abhigyata” the library cell. This was the first time a British Parliamentary Style Debate competition has been held in SIMS. The juniors to become a part of Confero devoted a lot of hard work and energy. “The house believes that a world without organized religion would be a better world” being the topic for debate. The government and the opposition obviously had conflicting views. The prime minister of the government believed that believing in God and following a religion are different and was supported by the members of the government where as the opposition was very determined in its approach and believed religion imbibes the inner force, which brings the equilibrium. The debate turned out to be a successful event and the confer team selected five juniors Pranav sood being the champion and Himani Yadav the first runners up. BE YOUR OWN BOSS !! The entrepreneurship cell pulled out an amazing event “MARKET BEAT” where the student managers participated with great enthusiasm. As very rightly said, “if you don’t build your dream some one else will hire you to help build theirs. The entrepreneurship cell helped the student managers to take the first step towards their endeavor. There was amazing food stalls, recreational activities and laundry services that people thought were worth their money. It takes more than an idea to launch a business, an entrepreneur is passionate, a visionary and an expert and needless to say the participants had it all. After a lot of brainstorming, analysis and voting the E-cell declared “Creativa” and “Sub-conscious” as the winners.